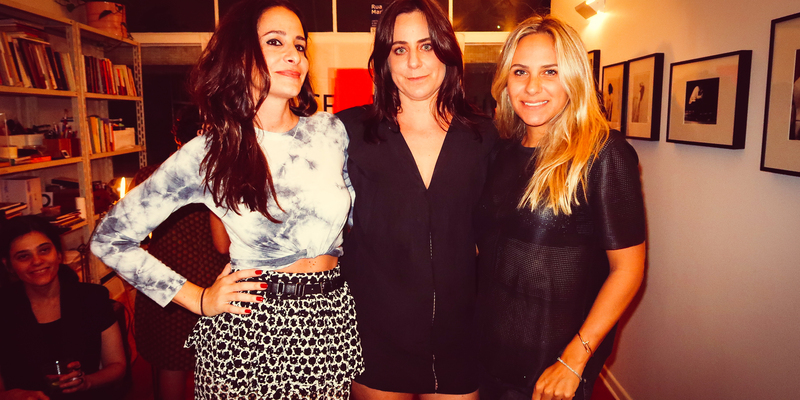 Paula Raia, Maria Montero, and Fernanda Vidigal. IT WAS MEANT to be noted. On a table near the front door, Maria Montero, the founder of Sé, a hip gallery in the heart of São Paulo, left some black ribbons with a message written in bold white letters. The dealer’s would-be souvenir for an evening of cocktails at her home on the first floor of Oscar Niemeyer’s iconic Copan building read “1964 never again.” It was the night of March 31, the kickoff of SP-Arte week in Brazil’s biggest city and also the fifty-fifth anniversary of the military coup that sent this nation into more than two decades of brutal dictatorship, a regime that tortured and murdered hundreds of dissidents. Days before, the country’s newly elected right-wing President, Jair Bolsonaro, instructed the armed forces to celebrate the coup, a historical episode he insists on classifying as a counter-revolution that prevented Brazil from going communist. While the beau monde fêted the arrival of yet another art week, clinking glasses of wine and gin and tonics and passing around the occasional joint, protesters paraded down the streets of major cities in marches for and against the old regime. Those in support of military rule, brandishing the national flag, staged a scene unimaginable before the elections last year placed a former Army captain at the helm of Brasília. In office, Bolsonaro has tried to make official a once solitary celebration—as a member of the lower house of Congress, he would film himself every year setting off fireworks to commemorate the moment democracy ended in Brazil. But, as collectors whispered at brunch the other day, the art world bubble is the last to feel the crisis and the first to emerge from it should one appear. Dealers at Montero’s get-together, Luciana Brito and Jaqueline Martins among them, zigzagged around the guests, who tripped now and again on the telephones arranged in a circle on the floor of the living room, an installation by artist Arnaldo de Melo, and the host’s gracious cats. The gathering was one of many around the first São Paulo edition of Condo, a project founded by collector Vanessa Carlos in which foreign galleries set up shop temporarily in a host gallery abroad, a model that allows dealers to show off their artists without the cost of attending a fair, especially an expensive one like SP-Arte. Nine galleries, some of them jumping ship from the big event at Ibirapuera park, decided to brave the twisted political climate in São Paulo. Marilia Razuk, a dealer with two spaces in the city’s west end, hosted Bogotá’s Instituto de Visión and Paris’s Antoine Levi. On opening day, Razuk told me her Parisian partner was having second thoughts about sending Italian photographer Lisetta Carmi’s images of trans people in the streets of Genoa to Brazil, fearing they would spark censorship or uproar—over the past two years, conservative groups have forced museums to ban or suspend shows revolving around homosexuality, for example, but freedom of expression still exists in the country, or at least it’s still in the books. Just a few blocks away, Luciana Brito’s space, a modernist house designed in the 1950s by architect Rino Levi, staged a group show with artists from Madragoa, Italian dealer Matteo Consonni’s gallery in Lisbon. Two paintings by Enzo Cucchi were the center of attention, one was hanging on what used to be the home’s fireplace. In a more discreet display, Grimm, a Dutch gallery with spaces in Amsterdam and New York, showed films by Guido van der Werve in a little room in Casa Triângulo’s big industrial space in the Jardins neighborhood, a presentation somewhat dwarfed by Brazilian artist Sandra Cinto’s massive installation covering all of the walls of the main gallery. The mood seemed festive all around. But below the bubbly surface of champagne glasses here and there, local dealers are crossing their fingers for the economy to pick up again. After years of consecutive slumps in sales, SP-Arte now shows some signs of recovery, but the number of galleries has stayed the same for the first time in its fifteen-year history, a fact that coincides with the arrival of Condo and its alternative model. Jaqueline Martins, who lent her space downtown to Italian gallery P420’s show of artist Joachim Schmid, served as an ambassador to the project in Brazil and has openly criticized bigger art fairs, a model she says is in urgent need of a makeover. In a season roiled by economic and political chaos, the smiles on dealers’ and artists’ faces during Condo injected a little energy, like a rainbow that forms after a heavy storm.